It's been a while since Joe and I riffed together about Japan, and I know that I for one have missed his wit around here. Thusly, I've invited him to join m, once again providing the counterpoint for a topic we've both thought and talked a lot about: the dichotomous nature of technology in Japan. Just as a disclaimer, we both recognize that neither "side" is right, and neither of us feel vehemently one way or the other. But rather than lay out overly cautious and qualified articles about the delicate balance of tradition and technology, we present our second installment of For the Record. So, is Japan the super hi-tech country that popular media make it out to be? The answer is both "yes" and "no;" but moreso "no." "Whoa whoa whoa," I can almost hear you protesting. "We're talking about Japan, right? The land of dancing robots and holographic pop stars. And I'm pretty sure they are to thank for giant mechs. What are you talking about, Paul?" Here. I can't be bothered to look for a picture of my old kitchen sink, but this photo is almost identical. Thank you, internet! You have your faucet, which offers water of one temperature - ground water temperature. Then you have your grimey gas heater for when you want hot water. I don't know much about pipes or gas, but isn't there a simpler way to get hot water? I've never seen a modern home in the US equipped with water-heater-boxes. Similarly my shower (whoops, I mean "bath," as I had no proper shower) operated only in cold mode. If I wanted to heat it, I had to fill my tub and then light an adjacent gas-fueled heater. Yes, just like how you'd heat water on your stovetop if you wanted to make tea or scald an interloper, this was part of my daily bathing ritual. And because I didn't have any integrated shower head/nozzle, whoever lived there before me had jury-rigged a laundry water pump and attached it to a hose and shower head. I eventually had to replace that pump and discovered that such devices are not intended for bathing. Electrocution was a very real concern at times. 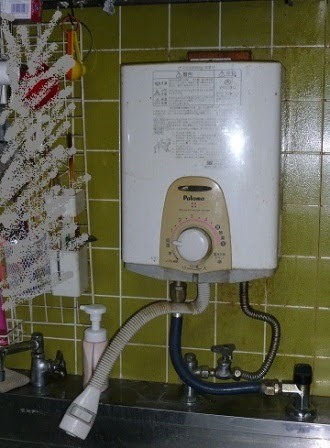 All because my old apartment, located about 20 minutes by train from Osaka, did not include modern plumbing. Then there are the toilets. I'm sure Joe will extol the virtues of the hi-tech Japanese toilet, and I'll grant that they are pretty friggin' awesome. When you can find them. On some occasions your only option will be the exact opposite of that, which is a hole in the ground. My friend Shadow wrote a pretty good piece about this some time ago. Now I've read that the, ahem...posture required for using these things is superior to sitting down. 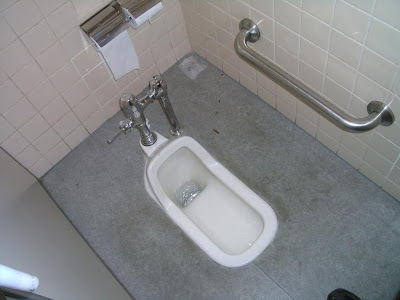 I also had some cheeky student tell me that using these toilets promotes strong knees. Phff. "Behold the wonders of the Japanese toilet!" - Shadow, probably. Question for any of you who work or have worked in an office: how often do you use your fax machine? Right. Now tell that to Japan. For all their fancy broadband, some Japanese organizations are awfully slow to realize that scanners and email are things. When I was in Japan, I saw a lot of VHS and mini discs.. My TV had an integrated VHS. 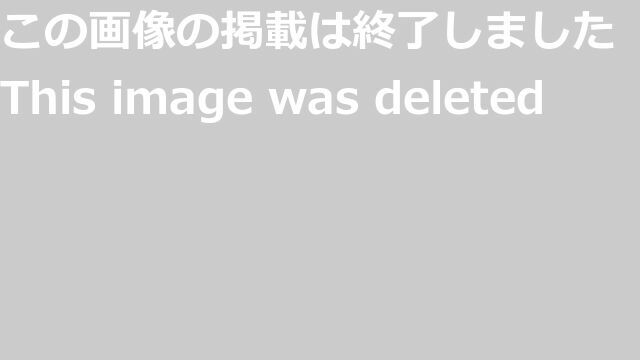 Granted, this was a few years ago; maybe by now Japan has advanced to the DVD/DIVX format war. I guess I might be looking at a proverbial mote in this case, considering we have our own hipster-shaped planks trying to resurrect vinyl records. But then again we don't purport to be the society of tomorrow! Have you ever watched Japanese talk or variety shows? One thing I've noticed is that instead of using blue screens and super cool graphics, a lot of J-programs use all kinds of arts-and-craftsy looking cutouts and dioramas. They're often attention-grabbing or cute, and they give the people on screen something to hold or do. But I can't help thinking that some poor guy behind the scenes probably spent like an hour creating that elaborate cue card that's only going to be shown for 5 seconds. And then what do they do with it? Same thing they do with the billions of disposable wooden chopsticks they go through, I guess. Feed them to Matsuko Deluxe (not pictured). Now don't get me wrong - I love a good pair of chopsticks. And I know this is not just a Japan thing. But hi-tech they are not. I think Jerry Seinfeld said it nicely. I could go on, but I think it's pretty clear: Japan may have some tricks up its sleeve, but it's just not the hi-tech paradise it's made out to be. 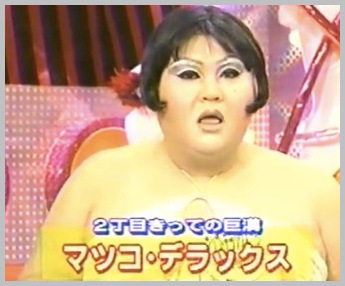 Edited 8/14/2014: I had incorrectly called Matsuko Deluxe "Mariko Deluxe." Whoops. I find the toilets and showers to be pretty nice. Maybe I just spend too much time in Tokyo. Chopsticks aren't so bad. I find certain types of cooking easier with chopsticks than western instruments. So there! And damn you Matsuko Deluxe will haunt my dreams for eternity. Blackboards. Schools and even many universities have yet to develop white board technology. My city board of education bought electronic white boards for every elementary school a few years ago. Most ended up in storage because no one knew how to use them, and more than a few ended up being written on with white board markers which ruined the screens. The the BoE decided to provide ipads to each JHS, but of course the schools didn't have wifi, so they were just expensive paper weights. I could start ranting about Japanese web design, but if I do that I'll never stop, so in short, I'm totally on the low tech side of this one! Gobbler - agreed, friend, chopsticks are pretty damn good (so arguably if it ain't broke, don't fix it). But the most technological country in the world should probably be feeding itself with nanobots or something. Sophelia - Oh yeah! The two schools I worked at had whiteboards, but I did see a lot of blackboards at other schools. Electronic ones, though - wow! I would have loved to see those. I like the fact Japan doesn't drop "the old" once something new comes along, the way that western countries seem to. The ancient along with the ultra-modern. Rickshaws and electric cars, cassettes and MP3, faxes and snail-mail along with email! That's definitely a valid preference, and there are "old things" in Japan I certainly love, too. But within practical limits, for me. I don't see the need for widespread use of mechanical typewriters or horse-drawn carriages, charming though they may be. Still, there can be decent reasons for some things. 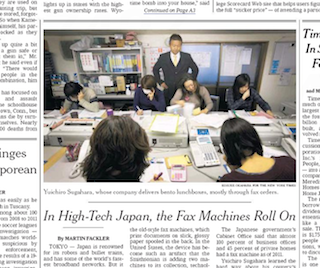 This may not be the reason fax machines are widely used in Japan, but they are more secure than email, for example.